A MOST UNUSUAL antique Dutch mid 18th century circular kettle stand, being executed in selected faded mahogany, the moulded top surmounted by an urn finial, the kettle stand with curved rectangular fretted panels on the four sides, these panels being divided by elongated rectangular fluted panels, the front having a drawer still retaining the original axe-head brass handle, the kettle stand supported on a shaped base moulding with four carved cabriole legs terminating in claw and ball feet, the interior with the original brass liner. A tea kettle of superb quality executed in pewter, which still retains the original decoration in near mint condition. The melon shape is not only very charming but also most unusual. The introduction of neo-Classical designs into the paintwork would point to the early neo-Classical period in European art. Another unusual feature of the kettle is the lacquered wooden handle which was especially designed so as not to transmit heat to the hand when pouring the boiling water. 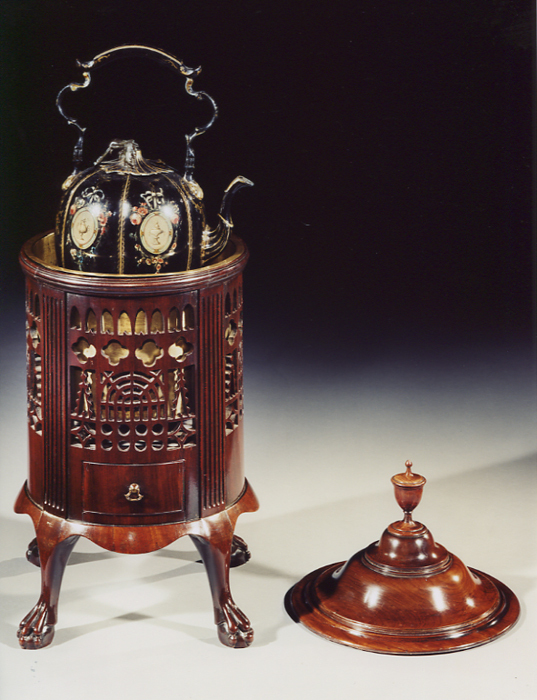 The burner and stand are also original and in a fine state of preservation. Although tea reached the zenith of popularity in China during the Sung Dynasty (960-1280), it was not introduced into Europe until the early 17th century, when Holland and England became the dominant players over Portugal and Spain in the newly discovered Far Eastern trade routes. Successfully cornering the market, the Dutch East India Company imported tea as an expensive plaything for the aristocracies of Holland, Germany and France. English royalty followed suit when Charles II (1630-85) married the Portuguese princess Catherine of Braganza, whose preference for tea at Court functions made the beverage fashionable both amongst the British aristocracy and the bourgeoisie. 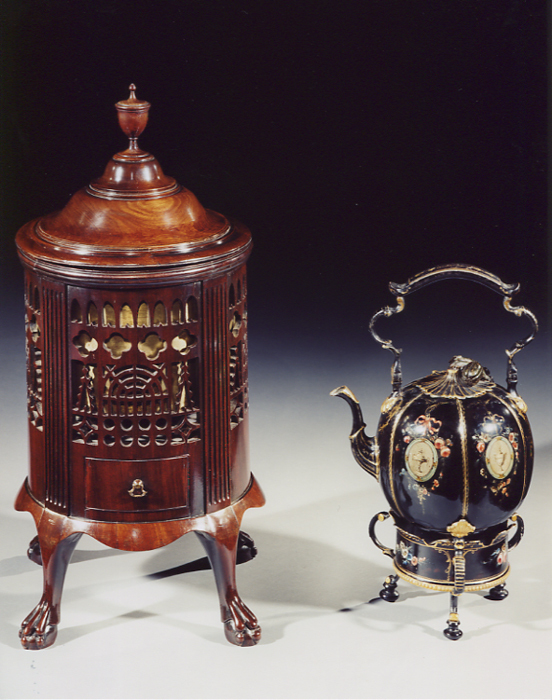 With the advent of specialised tea tables in the late 17th century, stands for the kettle and heater were introduced. 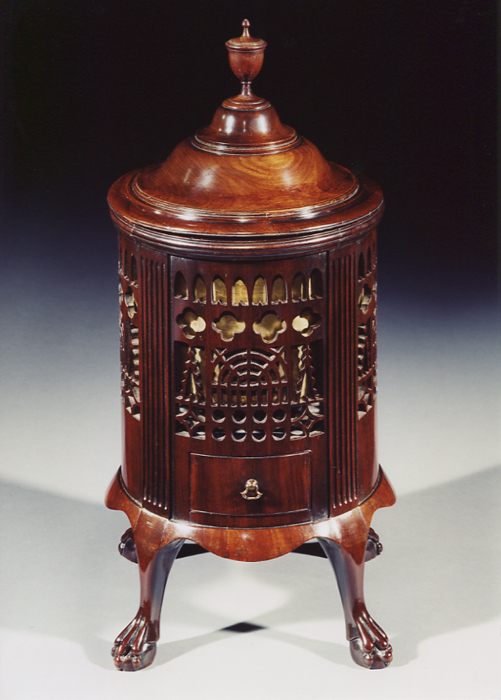 These took on many forms, amongst which was the box-like variety, mounted on cabriole legs. 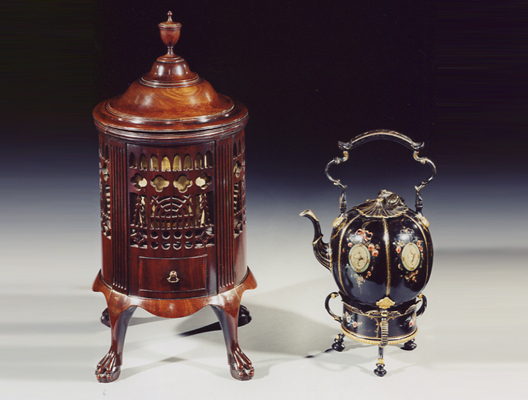 Such stands effectively protected the flame of the kettle-heater from draught and were usually lined with metal or brass. Overall height 24in (60cm). Diameter 10 3/4in (25.5cm). Maximum height 16 1/4in (41.2cm). Maximum width 9 1/2in (24cm).